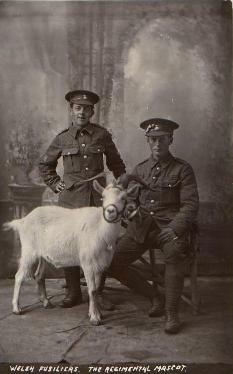 it is probable that the custom of having a regimental goat may date to to 1689 when the Royal Welch Fusiliers were formed. It is known that they wore the leek in their cap from an early period as a distinguishing mark, and it is possible that the goat may have also originated in that manner. In 1844, while on station in Grenada, the regimental goat died of heat prostration, and upon hearing of this misfortune, Queen Victoria presented the regiment with a goat from the Royal Herd which had been a present of the Shah of Persia. The custom has continued to this day, one being flown into Berlin in 1949 during the Soviet blockade of that city. During the Crimean War, the Goat passed away once again just prior to St. David’s day and the colonel’s grief was so great that a replacement was deemed necessary by whatever means possible. 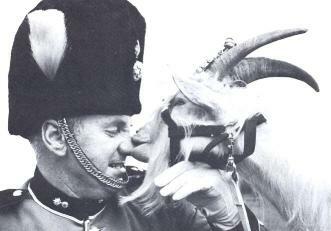 The present day goat is given the full honors of an officer by all ranks and is tended to by the Goat Major.